Quantum sails swept five of the top six positions in the 2015 J/105 North Americans at St. Francis Yacht Club in San Francisco. We checked in with the top skippers to find out what it took to win. 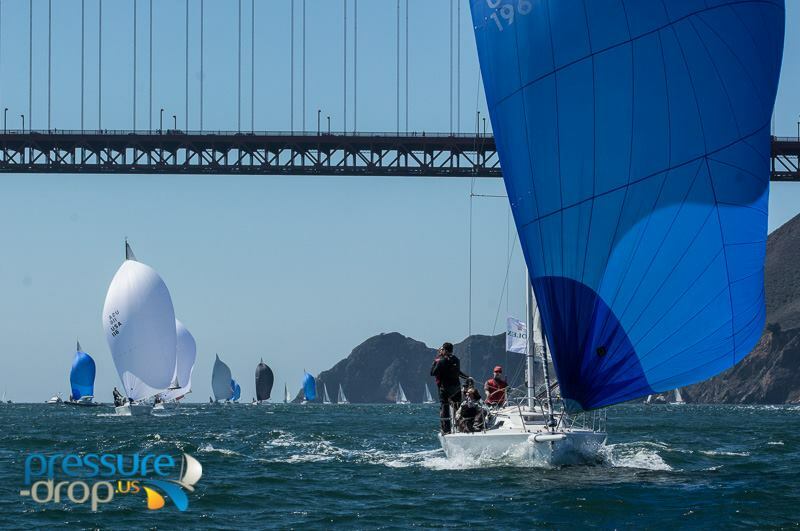 Five of the top six boats in this year’s J/105 North Americans, held in San Francisco simultaneously with the 51st annual Rolex Big Boat Series at the St. Francis Yacht Club, had complete or partial Quantum inventories. BBS is known for its long-format Bay tour races — of 68 possible courses, several of them were well over 20 miles. While there was a lot of great racing in a number of classes and divisions, the J/105 North Americans caught our attention. The courses included reaching legs, gates, and a couple of trips under the Golden Gate Bridge, as well as short-tacking duels up the City Front and the tactical decisions about whether or not to seek current relief in the cone of Alcatraz. All of this made for a rather unusual North American Championships format, but a welcome one, certainly for the Bay Area boats with local knowledge. We checked in with five of the top six J/105 skippers on the format, the competition, and what it took to win. There were a lot of good sailors in the fleet, so I expected it to be tougher competition than usual. I figured we’d go out and do as best as we can. Our goal was the top three. We ended up sixth, partially because there is more talent out there and partially because we didn’t execute our starts. We didn’t get good starts on the first day, so we were playing catch-up for the rest of the race, but we kept ourselves in the game. The key to doing well in this regatta was getting good starts that set you up for going in the right direction on the first leg, and knowing where you were going. They’re all bay tours. It’s a big picture thing. In the beginning, my idea was that it was more important to get a start that sent you in the right direction. I changed my philosophy after a while and looked for a good spot on the start line focusing on an open lane rather than being closer to the side that I wanted to go. The goal going in was to win. We thought we had a really good opportunity — a fast boat, a great crew, new sails — and we totally thought we could win the regatta. It didn’t work out that way, but that was the goal. We put a lot of time and pride into our preparation going into the race. We’ve been sailing together for two years, working on different maneuvers and different settings for the boat, so that when we got into these situations with variable conditions and long legs, we could adjust to them, but once you’re out on the water sailboat racing is sailboat racing. The finish of the first race was without a doubt the apex of the regatta for us. We crossed the line overlapped with Donkey Jack — it couldn’t have been more than five feet. To win that race was pretty exciting. A top-five finish was what we were trying to accomplish. We felt with the level of competition, there were 10 boats that could have won. There were a couple boats that are respected in their own fleets. In San Francisco, we have a little bit of an advantage being local. We wanted to take it one race at a time, try and get into the top five for each race. That was our focus. We knew it was going to be a light year, and we’re actually a heavy-wind boat. We like to have bigger air, so we really tried to keep the sails powered up. That was our real focus with our Quantum sails. The plan was to sail conservative. We felt like we had the boat speed as long as we minimized mistakes. We actually had poor starts and were able to dig back through the fleet. That was probably the most impressive thing of the regatta—to be in a deep position and end up with a top-five finish. We put ourselves in tough spots off the line and were able to dig back. It was disappointing that we missed two races. Once the wind came in, it was a pretty awesome Big Boat Series. It wasn’t too windy. It was probably one of the best weather-wise. The tides played a part, but they weren’t mammoth tides. It was spectacular. It was probably best Big Boat Series I’ve been to, conditions-wise. What’s nice about Big Boat Series is that there’s a different course every time for a new challenge, but for a North Americans, that’s a little different because you’re used to having your own racecourse. We found it enjoyable, actually, with all the different features, colliding with the other fleets, but it certainly adds a layer of difficulty—free and clear and ahead doesn’t mean some other fleet isn’t going to come along and pin you out, force you in another direction, or even cut in on your air or roll you. You’re not only managing your own fleet, in terms of covering them if you’re ahead, you’re also trying to manage the lay line and traffic management. There were a couple sheer terror moments, like when we were going upwind on starboard and we were doing a back-and-forth trying to get around Kialoa III, the 78-foot maxi. We thought, if that thing hits us, we’re done. Congrats to all of the teams. You can view the full results of the 2015 J/105 North Americans and the Rolex Big Boat Series here.